Trails Carolina, a Wilderness Treatment Center for teens ages 10-17, offers a powerful therapeutic intervention which combines the strengths of wilderness therapy with the residential respite and facilities of a treatment center. 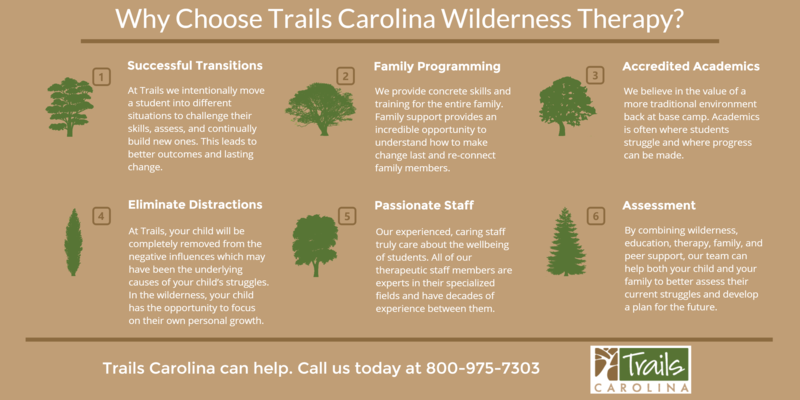 Trails Carolina is designed to allow clients the opportunity to venture deep into the outdoors under the protective guidance of clinicians and expert staff. The goal is to remove technology, damaging temptations of daily life, and negative influences and allow the quiet solitude and natural consequences of the wilderness to teach stronger coping skills and emotional control. Treatment should be a consideration when families are struggling with child whose behaviors and actions are negatively impacting the child and family life on a consistent basis. These struggles often include a child who is angry, defiant, depressed, under-performing, struggling with relationships, having suffered a traumatic event, working through attachment issues, and / or experimenting with drugs or inappropriate sexual relationships. In the range of treatment, wilderness therapy combined with a wilderness treatment center environment have been found to be extremely interventions. Duration of care is relatively short while assessment and diagnoses are typically strong. What path will clients choose in treatment? School. For instance, when a client enters Trails Carolina they will participate in academics. Many clients who attend our program are struggling with school– underperforming, refusing school, lacking in study skills, or struggling with an undiagnosed learning disabilities. Our wilderness treatment center offers the chance for licensed teachers to provide a structured, supportive educational setting. This increases the probability for focus, intentional instruction, and academic success. Testing. One of the strengths of Trails Carolina is the ability for professionals to get a 24/7 assessment of clients. This helps improve diagnoses and reassessment of initial diagnoses for more accurate treatment plans. Adding assessment into the overall wilderness therapy intervention allows for programs to conduct more sophisticated testing and clinical appointments, when needed. Real-World Transitions. Clients who exclusively reside in the wilderness may only interact with their peer group plus a limited number of staff and therapists. This can lead to a misguided interpretation of their long-term readiness for success outside of treatment as the client may have strong and healthy relationships with a select group of individuals. 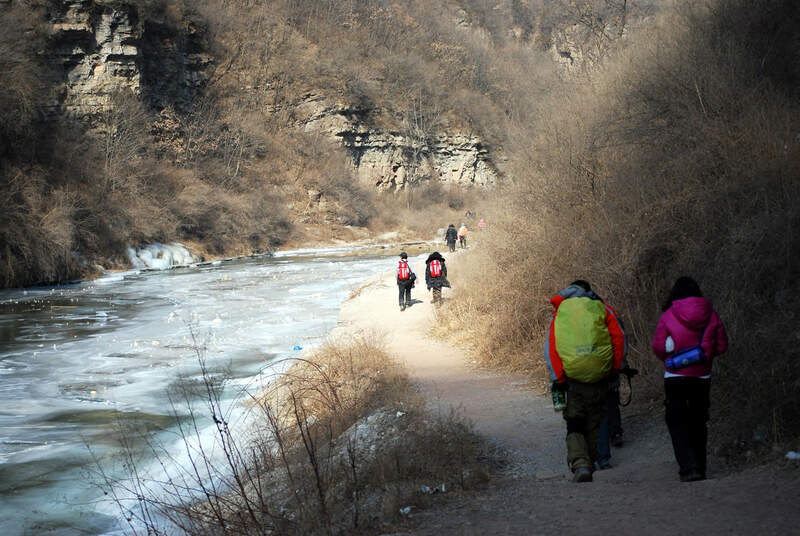 A base camp setting, however, can offer clients the opportunity to transition outside of their wilderness routine and interact with different individuals in different environments. 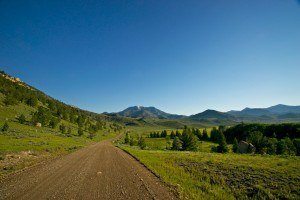 These changes in interactions, routine, and environment reflect the transitions a client will make in their “real world” settings they will return to after wilderness therapy. Practicing these transitions in program can be incredibly useful for identifying opportunities for continued improvement. Chad Hepler started a slippery slope of progressively more experimental and debilitating drug use at the age of 14. Hepler slid from marijuana use to more powerful substances. He wrote a book chronicling his descent and then the value he received in his experience at a wilderness treatment center. Hepler’s book reviews not only his struggles but then how he successfully transitioned into a college environment to continue on his newfound path to sobriety and healthy living. While more spa-like in its goals and impact, the sensory experience and invaluable reflection and mindfulness that resulted from this journalist’s wilderness treatment center experience offers a different and unique perspective on the value of removing life’s daily stressors. During the wilderness portion of her expedition the author was able to have time to enjoy and reflect. This book explores the growing range of treatment options and proposes the value in selectively and carefully choosing treatment alternatives whether that is local outpatient, wilderness treatment, residential treatment, or a wilderness treatment center. The book analyzes growth trends, effectiveness, and the impact of internal (e.g. client readiness) and external (e.g. geography, disruption to current status and routine) conditions. This book encourages strong match of need and resources. Randomized sample of adolescents in multiple program types: wilderness therapy, residential treatment, or wilderness treatment centers. The study explores commonality of issues preceding treatment which were shown to include oppositional defiance, aggression, family history of mental health issues, and trauma, among other issues. Client profile is explored as a critical component in the type of programs available and forecasted growth in industry based on this researched need. Regression analyses were performed on a large random sampling of clients who received wilderness treatment center or residential treatment center care. According to the sampled population, strong outcomes were seen more prominently in females and specifically reflected by those with a history of sexual abuse.